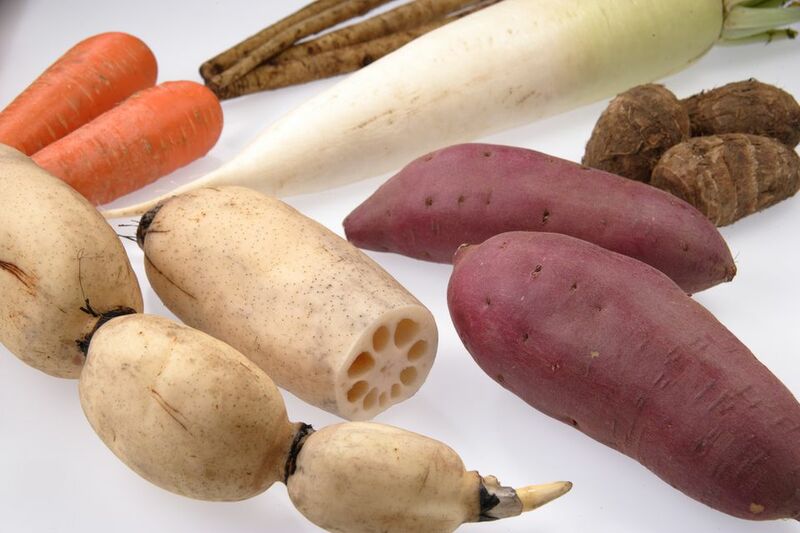 If you've ever wandered through the produce section of a Caribbean specialty market, you've probably noticed an abundance of ground provisions like edible roots, tubers, and corms. You might feel a little overwhelmed by the large assortment, and maybe even confused as to what’s what. That's not surprising; a single ground provision can go by many different names and may even be called something it’s not. All three species are part of the same family: Araceae. They're more alike than they are different and they're interchangeable in recipes because they're related. They're prepared in a variety of ways, such as baked, boiled, grilled, and fried. The young tender leaves of the plants are used to make callaloo. The corms and leaves of all three species must be cooked. They can't be eaten raw because they contain calcium oxalate, the same chemical compound that makes rhubarb leaves inedible, but cooking and steeping them in water eliminates the chemical. Rich in Vitamins A and C, the starch processed from the corms is easily digested and is often used in baby food. All three species have spread and naturalized throughout the world, so you can find them just about anywhere. The plants that grow from these corms are known as elephant ears in the U.S. and are mostly grown as ornamental plants. Don’t they know something delicious is growing under there? Of all the vegetables, malanga (yautía) causes the most confusion. It looks so much like the related taro and eddo corms that a number of common names are applied to this group and they're often used interchangeably. This genus goes by many names in the Caribbean, including yautía, malanga, tannia, tannier, tanier, and cocoyam. This corm has an elongated shape and the skin is bumpy, patchy, brown, and shaggy. The flesh inside is slippery but crisp. It can be white, yellow, pink or purplish. The flavor is nutty and earthy with a waxy, starchy consistency when it's prepared. This particular species is native to the lowland tropical areas of South America where it was first domesticated as a crop. It spread into the Antilles, then the Caribbean. It’s especially favored in Cuba and Puerto Rico in dishes such as sancocho, mondongo, pasteles, and alcapurrias. The young tender leaves are used in callaloo in Trinidad, Tobago, Guyana, and Jamaica. Also called eddo, this species is native to China and Japan. It can grow in cooler and drier climates, so it's a suitable crop in parts of North America. These corms are generally smaller and rounder. They resemble striped, hairy potatoes. The flavor of the leaves and corms are a little acrider and the flesh is a bit slippery. Another common name for the taro species is dasheen. This variety is a tropical perennial and it likes a moist and warm climate. The plant originates in Southeast Asia and Southern India. Certain parts of the Caribbean provide the ideal growing conditions. Taro or dasheen should have a sweet nutty flavor. It shares the same brown, hairy appearance as an eddo or yautia. The taro’s flesh takes on a bluish appearance when it's cooked. It's quite popular in Hawaii, and it's the key ingredient in poi.